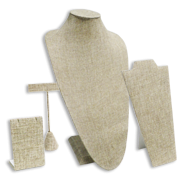 Shop our large assortment of burlap jewelry displays and impress your clients with your showcasing! Obtain a natural linen look right away with these burlap wrapped pieces, available for every type of jewelry: from earrings & necklaces to rings & bracelets and more. Get the best wholesale deals for burlap T-bars stands, boxes, pillows & trays.